Cracking, chipping or breaking your tooth can be quite scary; the pain is nothing to joke about either. The good news is your teeth can be fixed and your natural smile restored. At Humming Bird Dental Studio, we use various methods and products to replace chipped, cracked and any broken front tooth. The choice of material and method used usually depends on the extent of damage. We see a lot of damaged teeth cases and we have developed our expertise in various treatments for these cases. What causes cracked and broken teeth? Craze lines are the tiny cracks that appear on the outer enamel; they are quite common and usually harmless besides their visibility. The tooth cap is the chewing surface of your tooth. A chipped tooth refers to when this chewing surface of the tooth breaks off. This is also quite harmless in most cases, it does not cause much pain but it should be fixed. A cracked tooth is likely to cause more pain than any of the other kind of damage mentioned above when the crack extends from the chewing surfaces to the root of the tooth. Leaving a cracked tooth untreated can cause a lot more serious dental problems including the loss of the tooth. 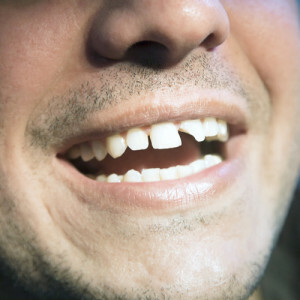 With time, the cracked tooth may develop into a split tooth if it’s not repaired. The tooth splits into distinct segments that can be separated and this tooth cannot be saved entirely. A vertically broken tooth is one of the worst-case scenarios when the fracture extends from the root towards the chewing surface. This tooth is likely to show minimal symptoms but the surrounding gum and bone may be infected. We can use dental inlays and dental onlays to repair structural damage to your tooth. Inlays and onlays are more conservative than crowns but they are still effective and less expensive. Inlays and onlays are indirect fillings that do not weaken the tooth structure but make it even stronger restoring as much as 75% of the tooth’s chewing force. We install dental inlays within the cusp tips of the tooth while onlays are structures that cover the entire chewing surface of broken tooth cusps. We use dental inlays and onlays made of tooth colored porcelain or composite resin. However, we do not limit ourselves to these materials only, we can also use gold. We create dental inlays in the laboratory using the specifications of the tooth than needs restoration. During your dental procedure, the dentist will remove any decayed portions of the damaged tooth and create an impression of the remaining part of the tooth. This mold is what the laboratory technician used to develop the inlays and onlays. The restoration pieces shade matches the teeth color so it blends in perfectly with the rest of the teeth.